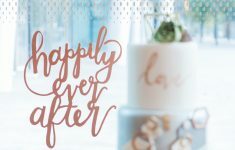 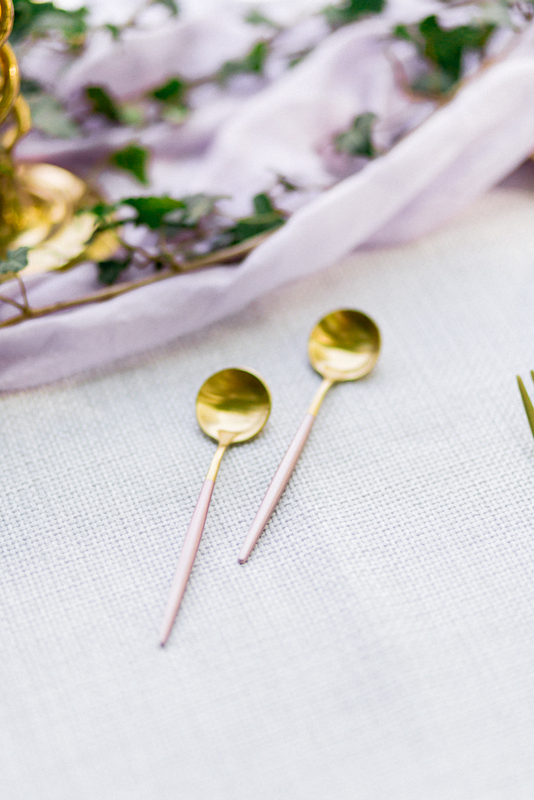 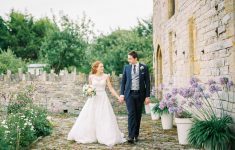 Philippa Sian Photography shares her latest beautiful shoot with a variety of fashionable looks created by Sophie Ellen Style and a romantic wedding table styled by the wonderful duo Fleur + Fig! 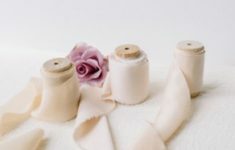 “The design and concept for this editorial stemmed from colour palettes and trends for women’s fashion for SS19. 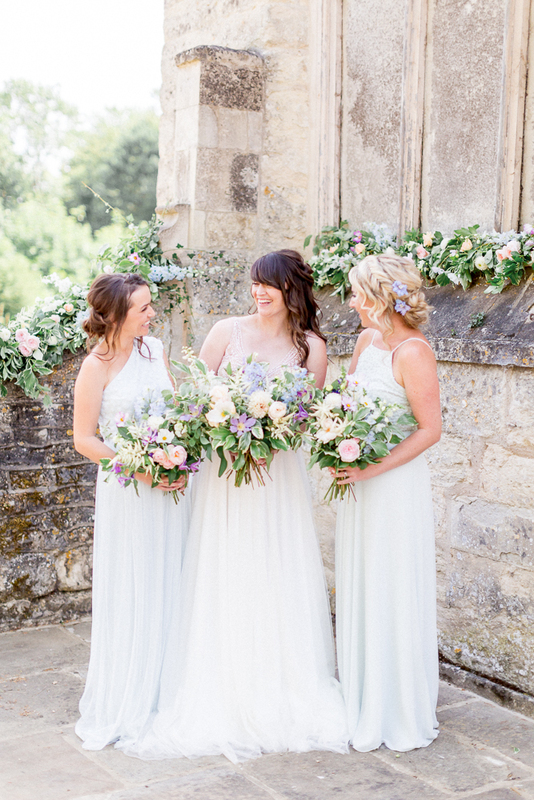 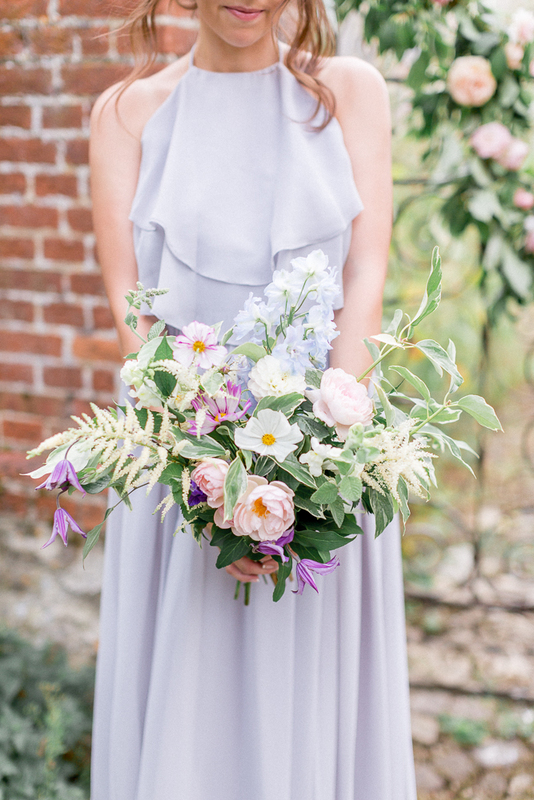 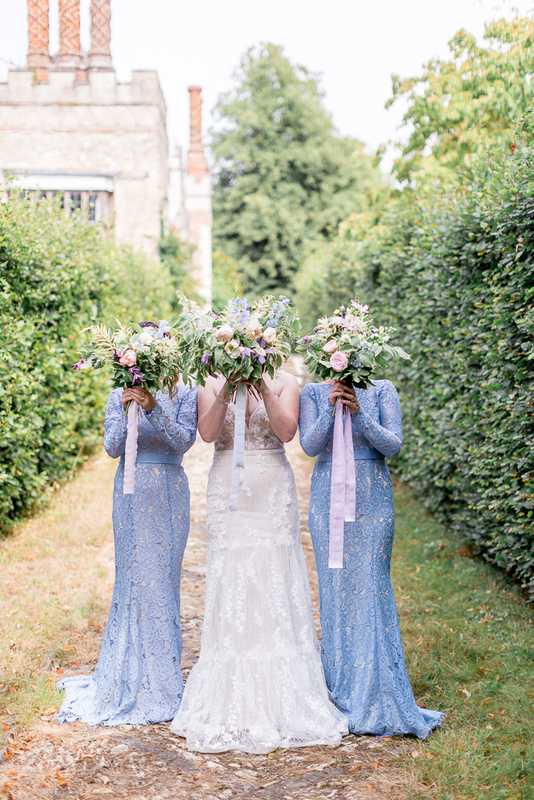 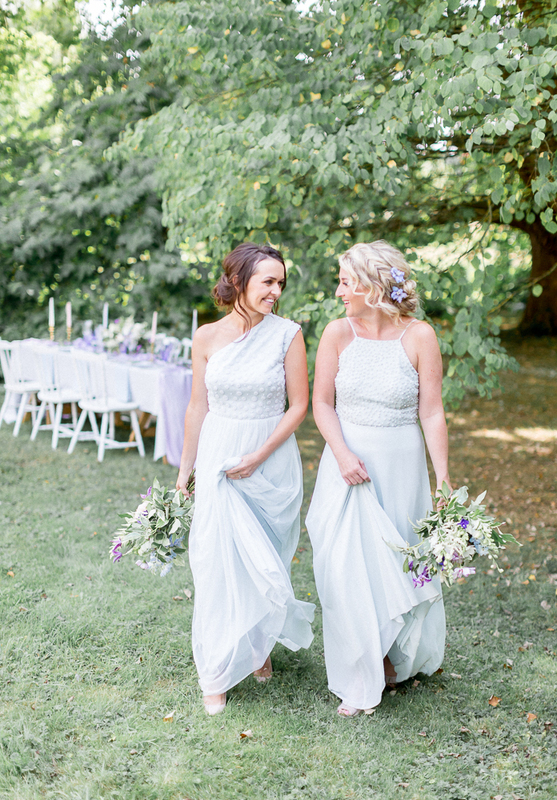 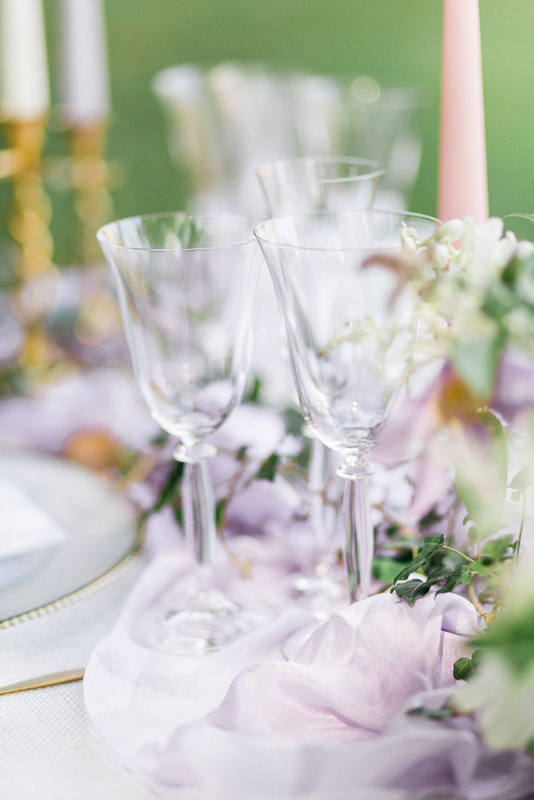 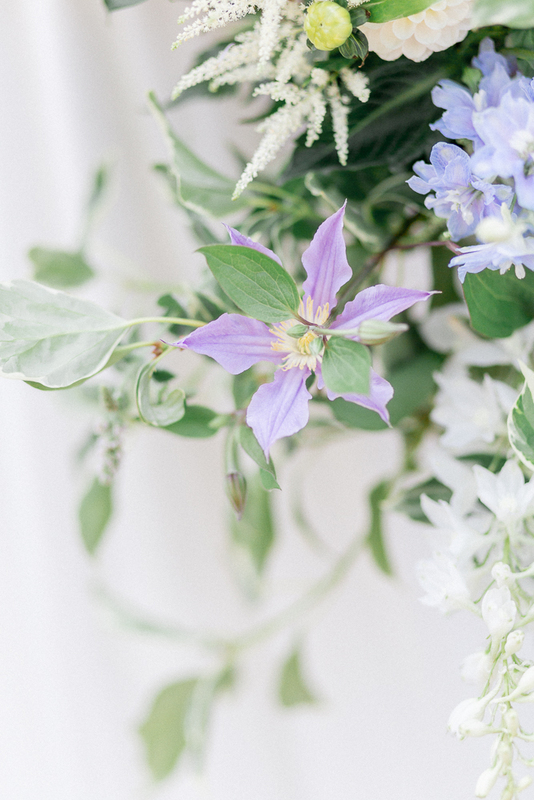 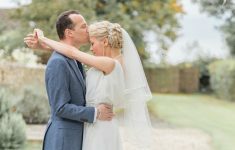 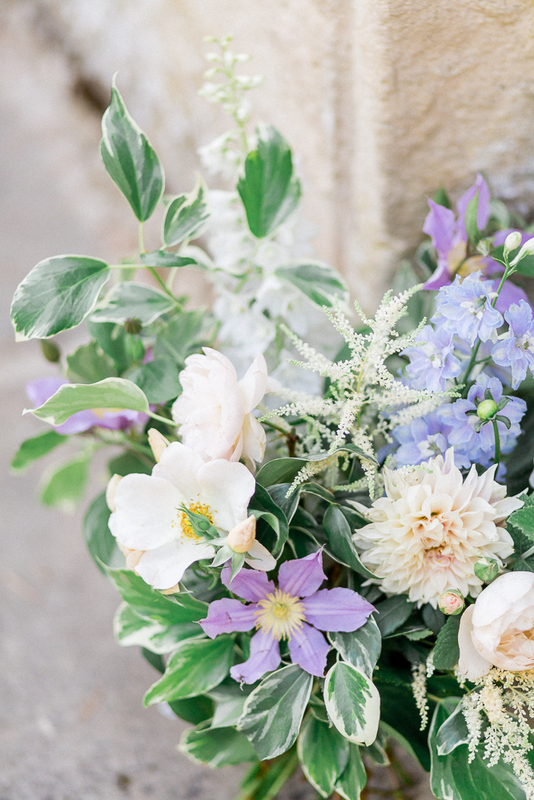 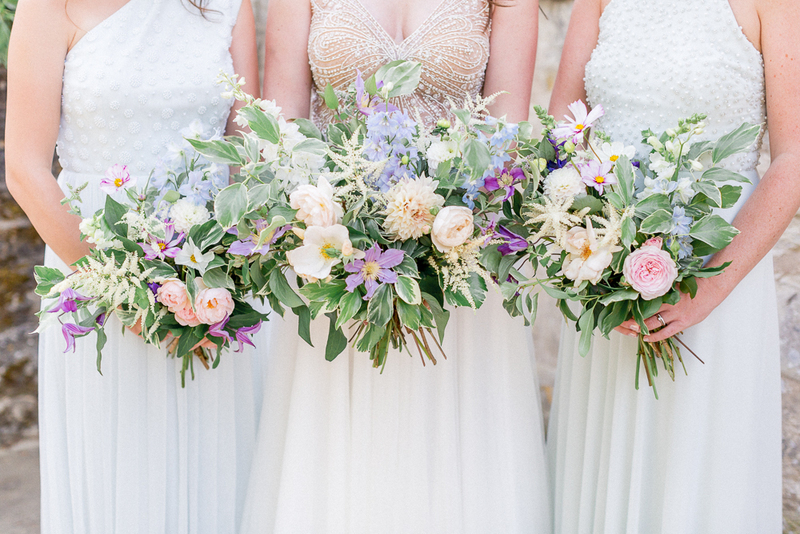 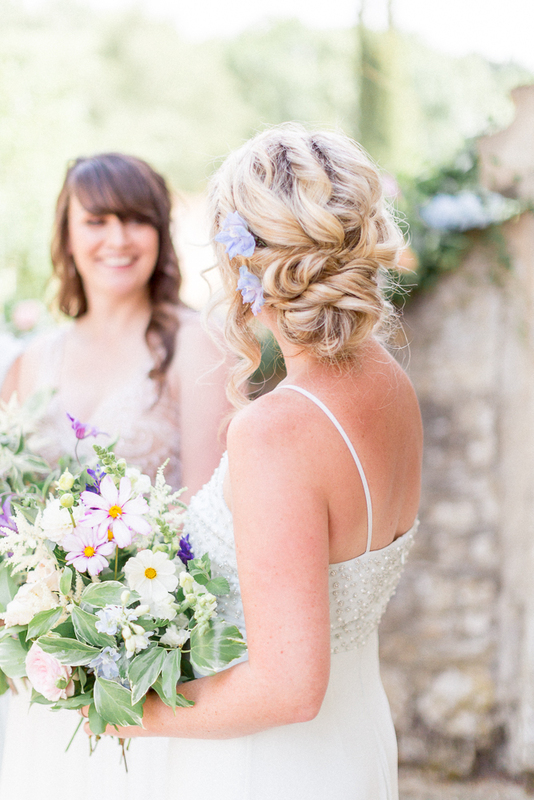 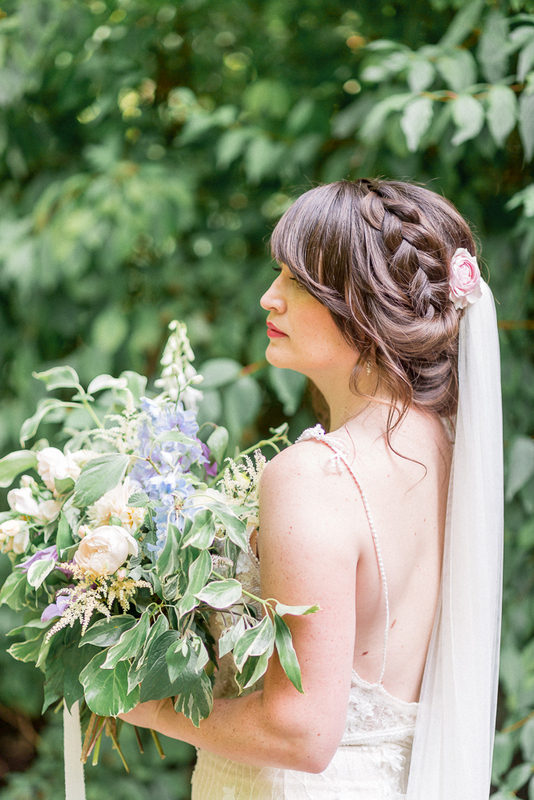 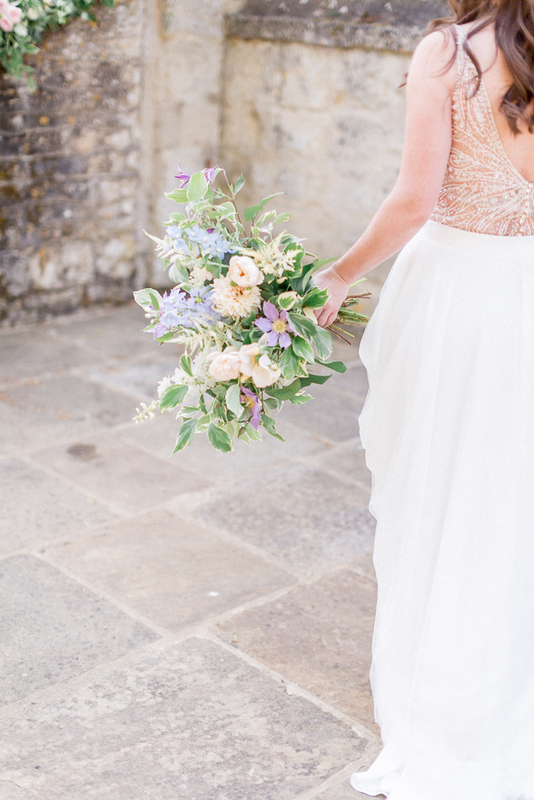 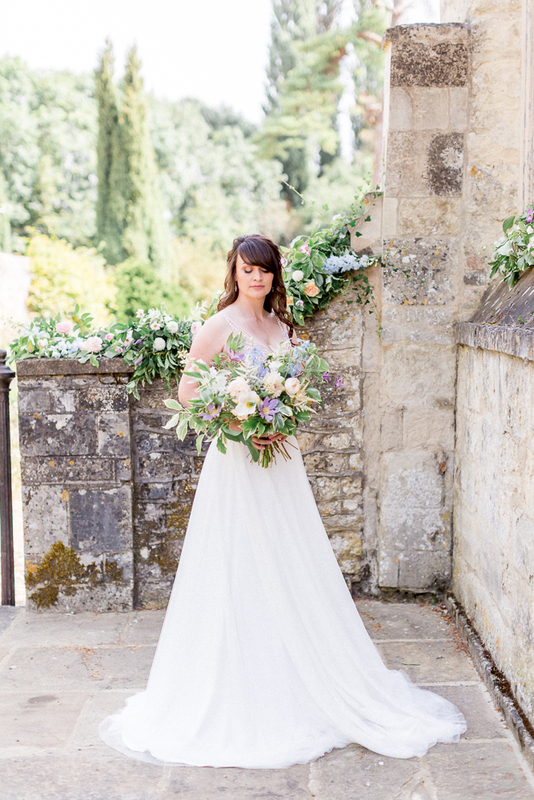 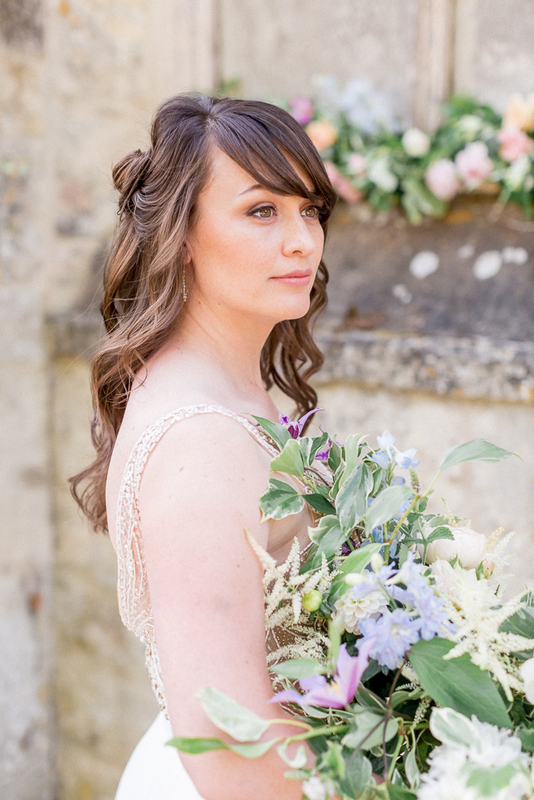 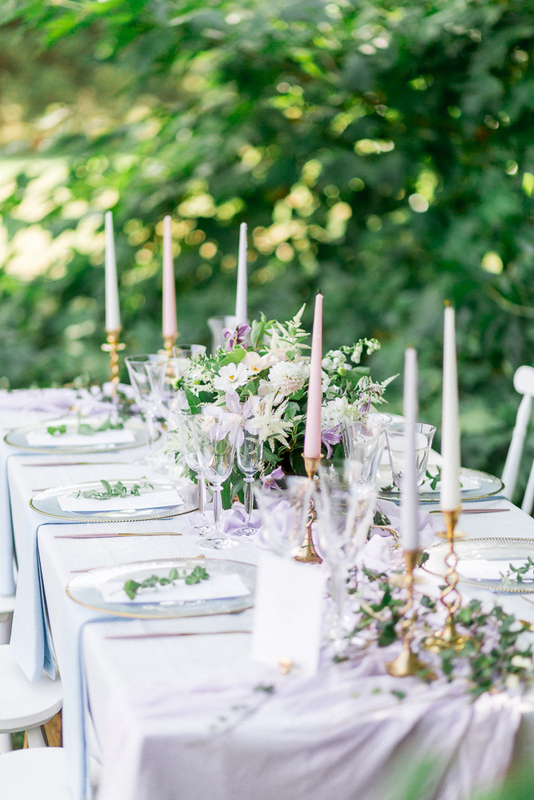 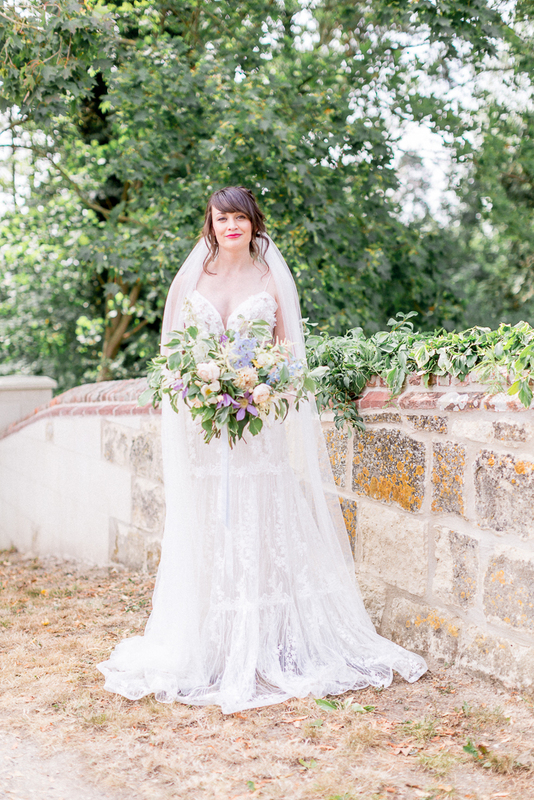 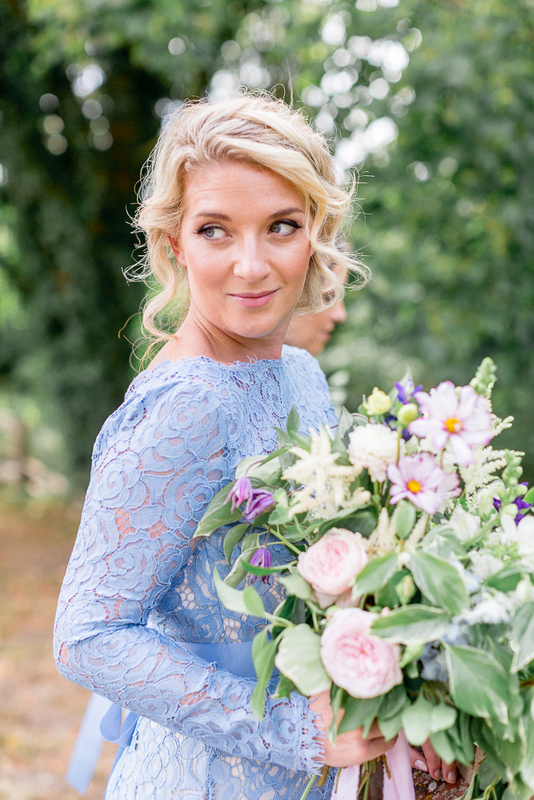 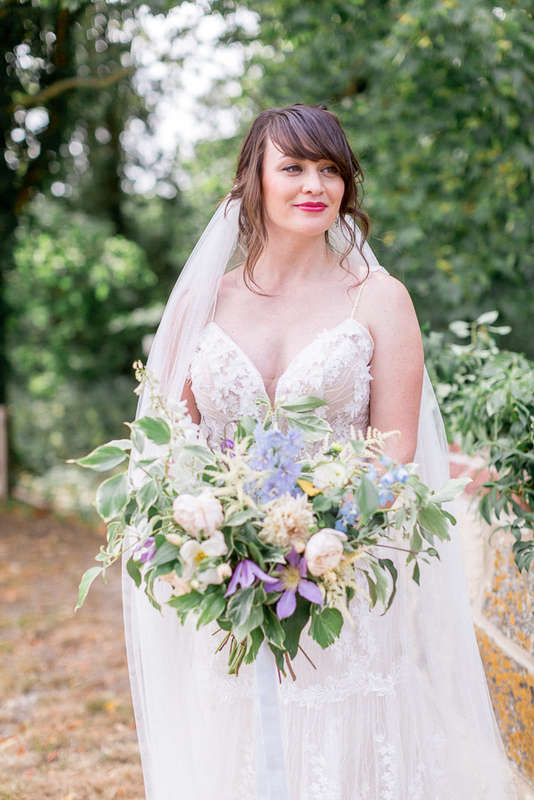 With Sophie Ellen Style’s fashion insights, main trend colours for 2019 weddings are set to be lilac and powder blues – perfect for summer weddings! 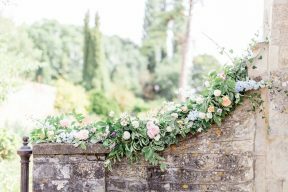 From there, Sophie styled the fashion elements to the shoot while Fleur & Fig took care of the design the all other decorative shoot elements. 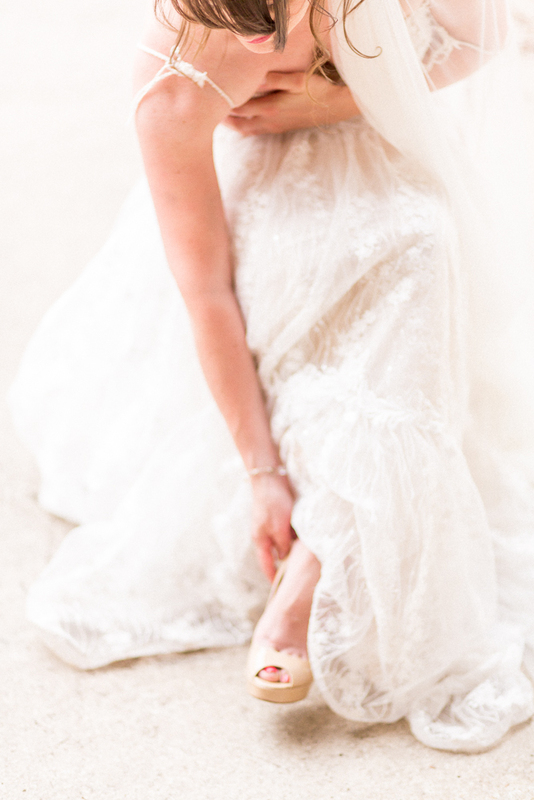 The bridal looks were inspired by the modern day bride who likes unique detail. 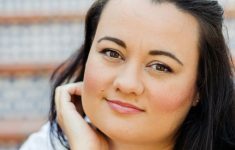 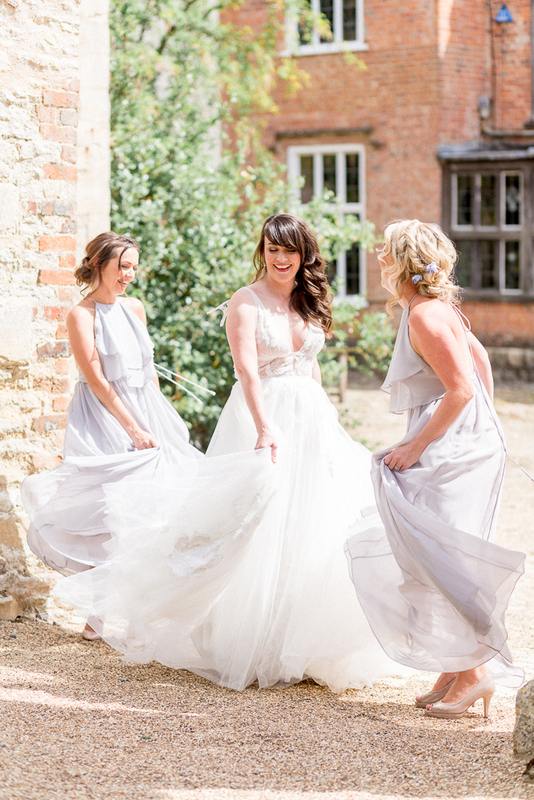 Each looks showcases dresses from Halo and Wren bridal boutique that focus on the importance of having that little something extra about them. 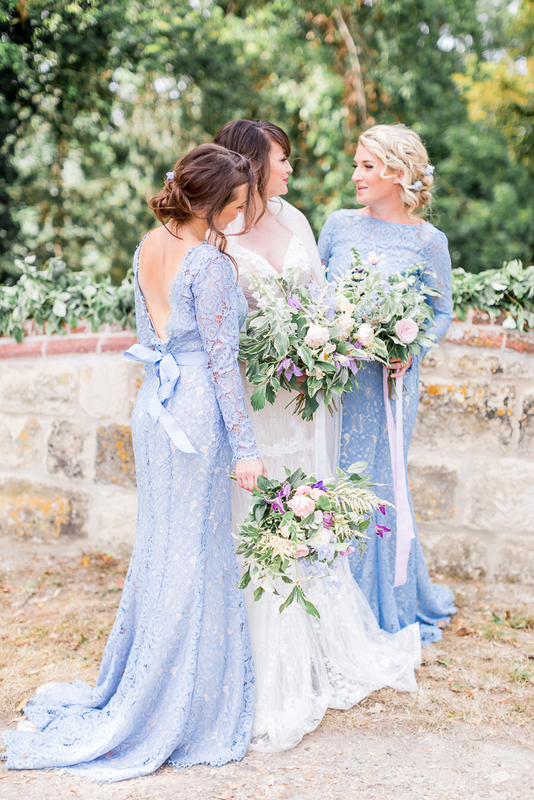 From feminine embellishment to floral embroidery and subtle sequins, all the dresses stand out from the crowd. 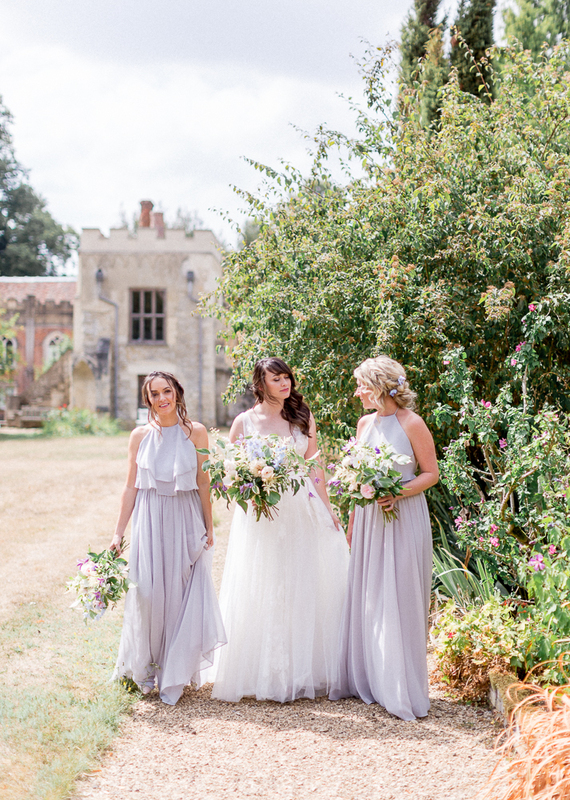 The beautiful bridesmaids looks focus on the hottest shades of washed lilac and pale blue for SS19. 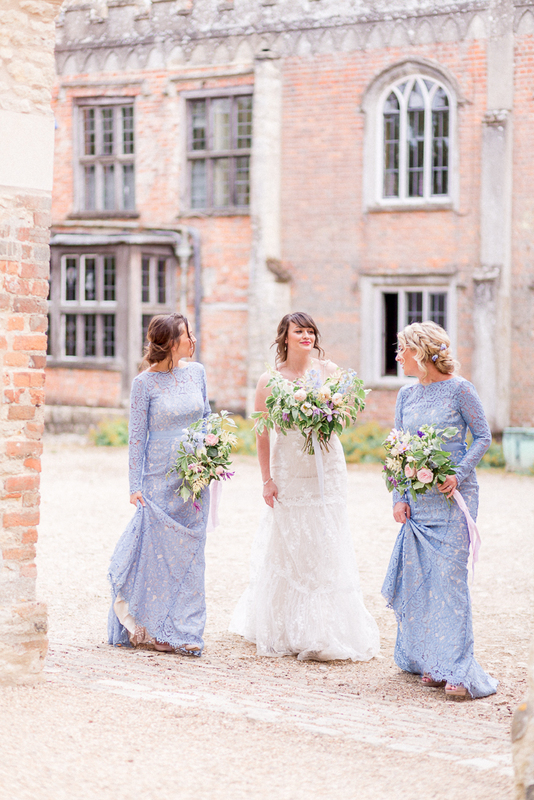 Each look showcases the hottest shades for the new season. 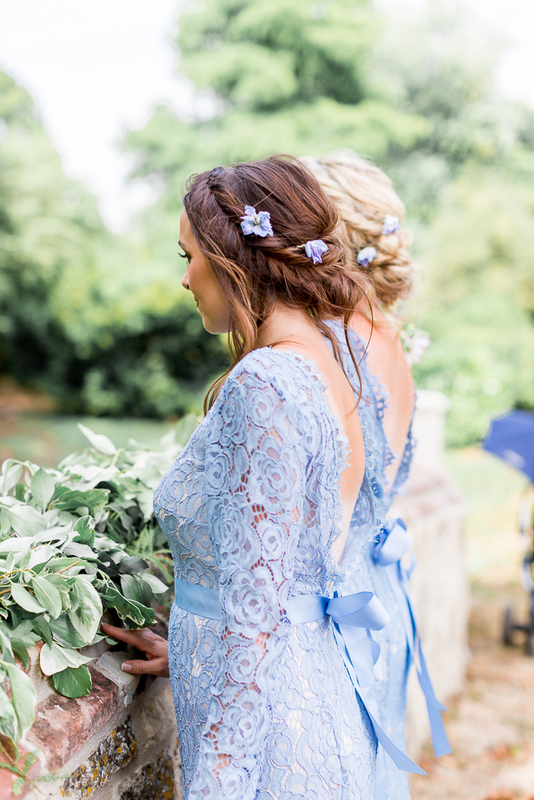 From subtle embellishment to intricate lace detail and effortless frills, these modern day bridesmaid dresses complement every bride for the perfect day. 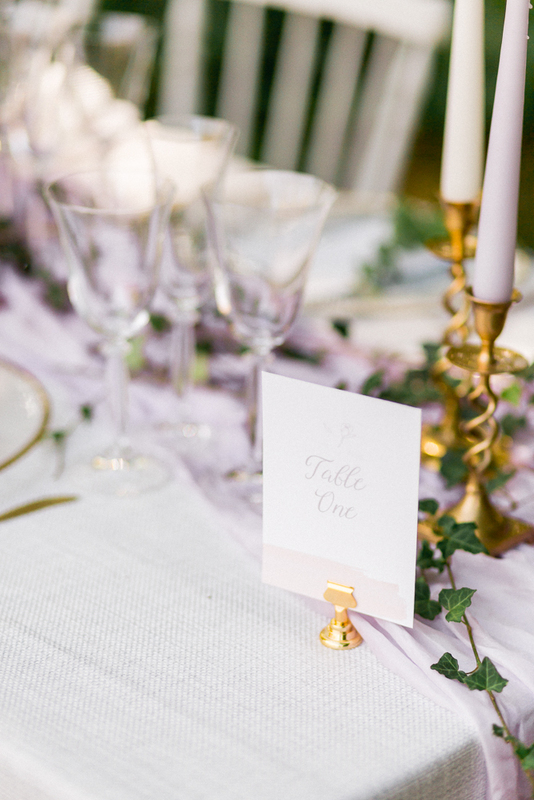 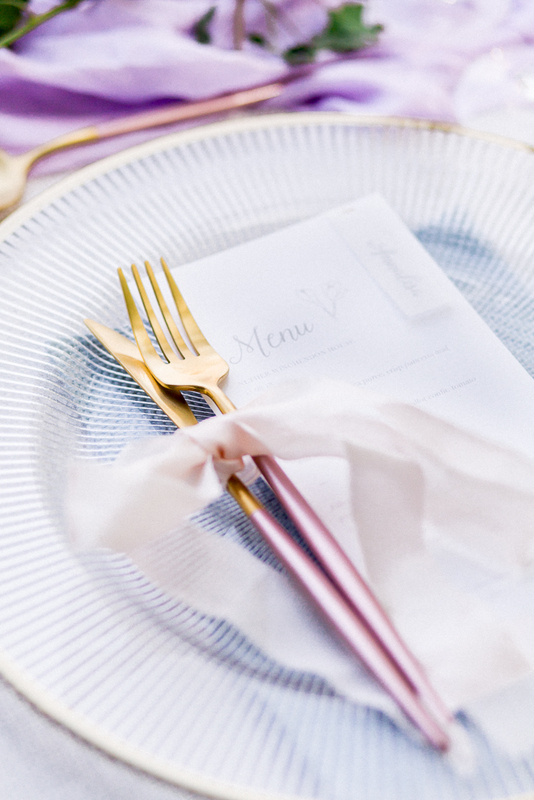 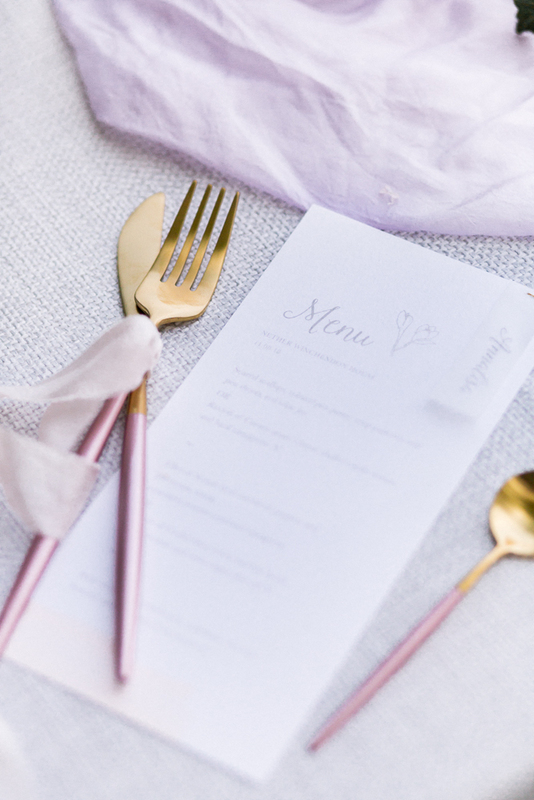 The tablescape was designed with a luxury and modern feel with nods to the editorial colours in the palette. 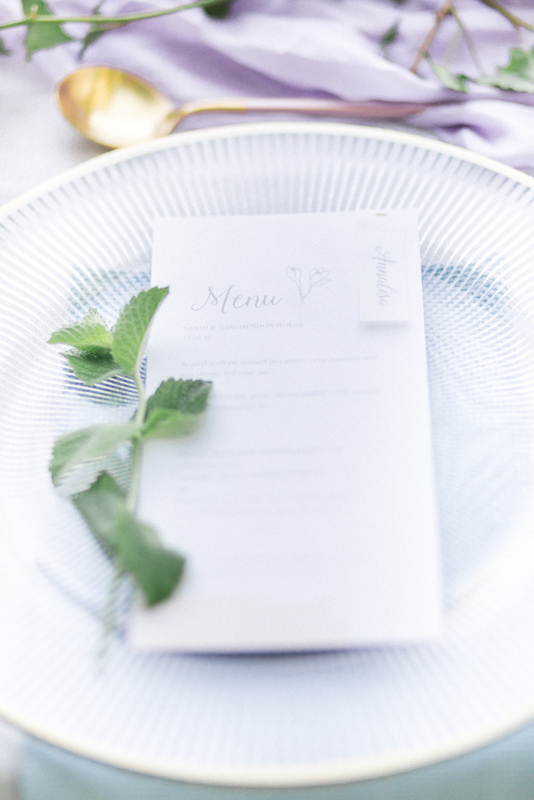 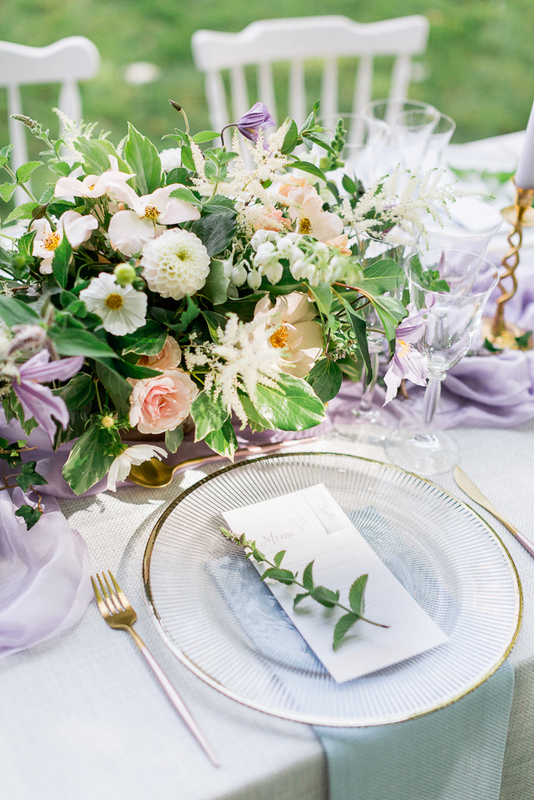 With subtle pops of lilac and blue through glassware and linen, this tablescape design offers a fresh look while still feeling romantic. 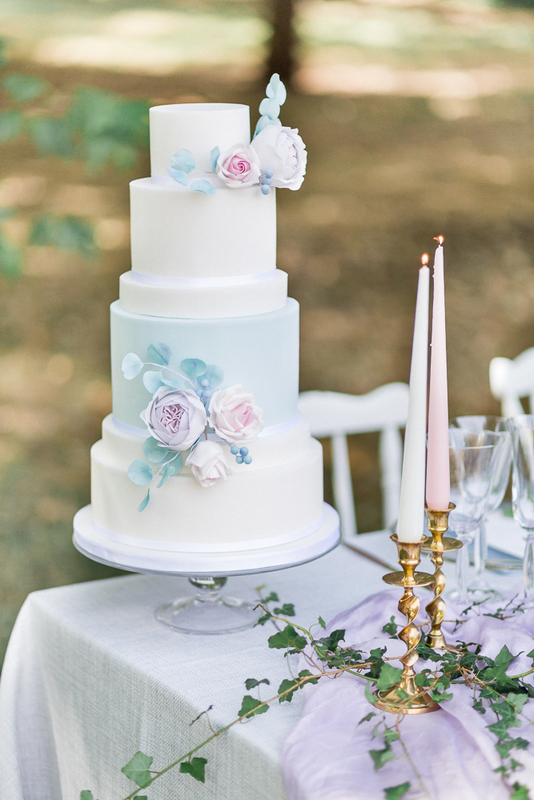 Pastry Chef Lindsay Pemberton has created an elegant four tier wedding cake finished with crisp sharp edges in white & pale duck egg blue. 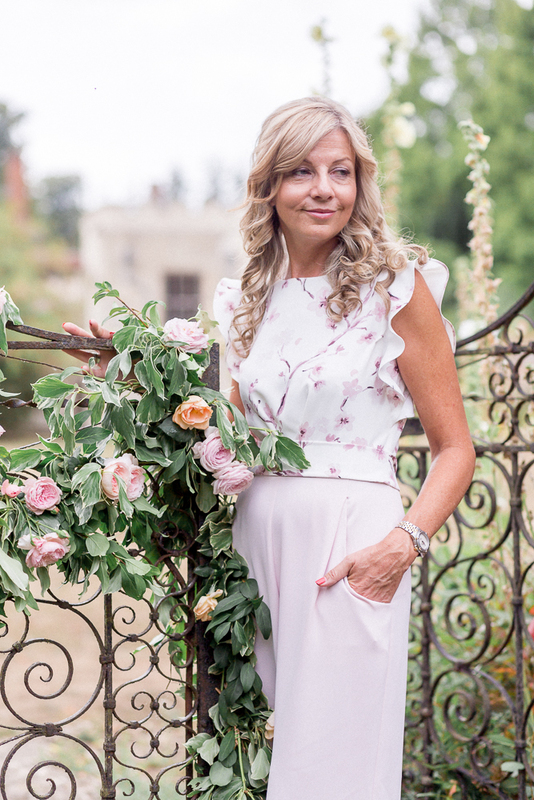 Her passion for sugar flowers shines through in the delicate dusky pink sugar roses and David Austin roses in the softest lilac which are nestled together with eucalyptus leaves and berries. 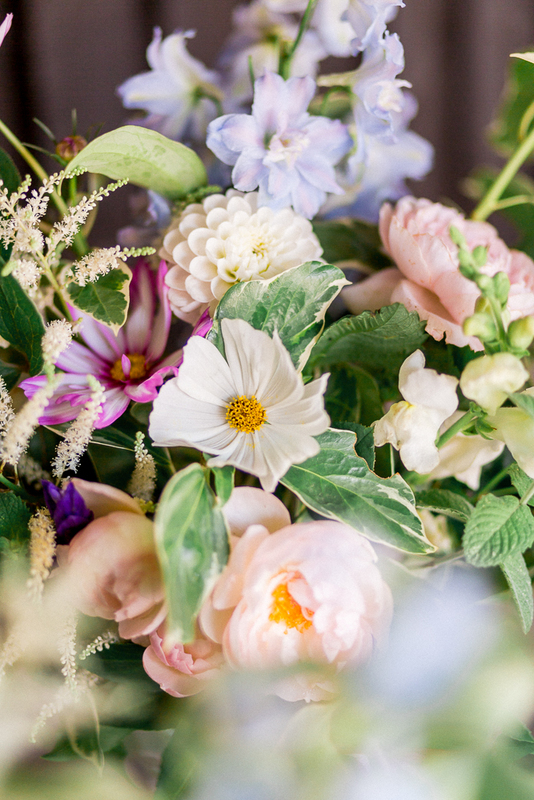 Hibbert & Hagstrom specialises in wilderness-styled wedding flowers. 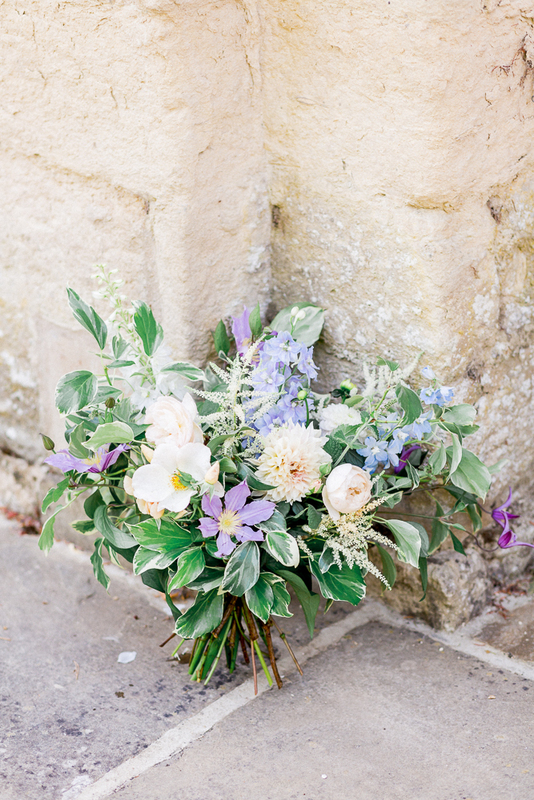 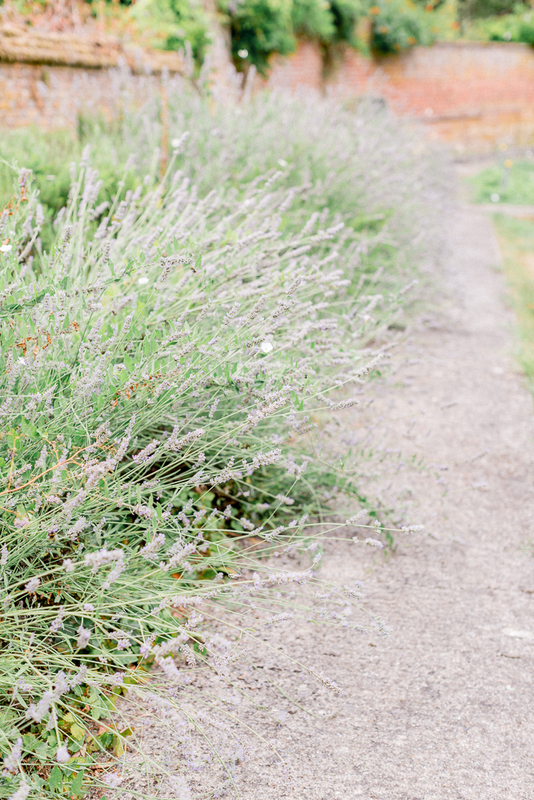 I love using British-grown flowers in my arrangements as well as plenty of foliage to create a wild and natural feel. 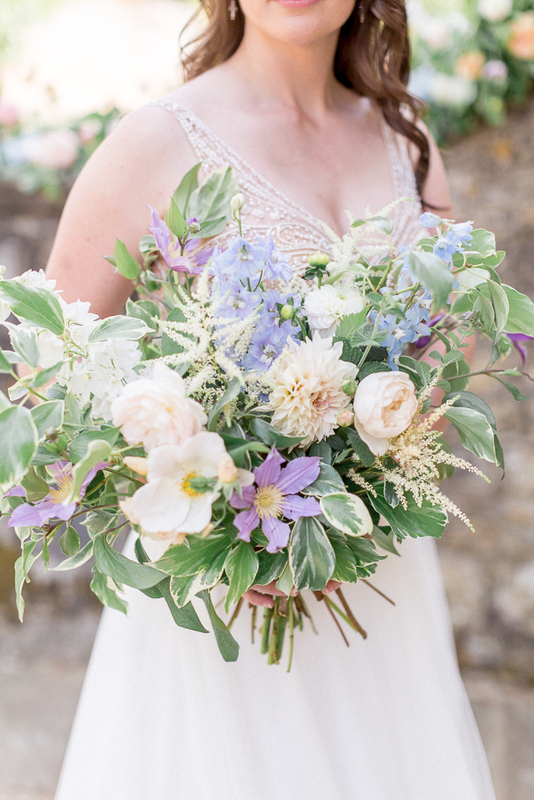 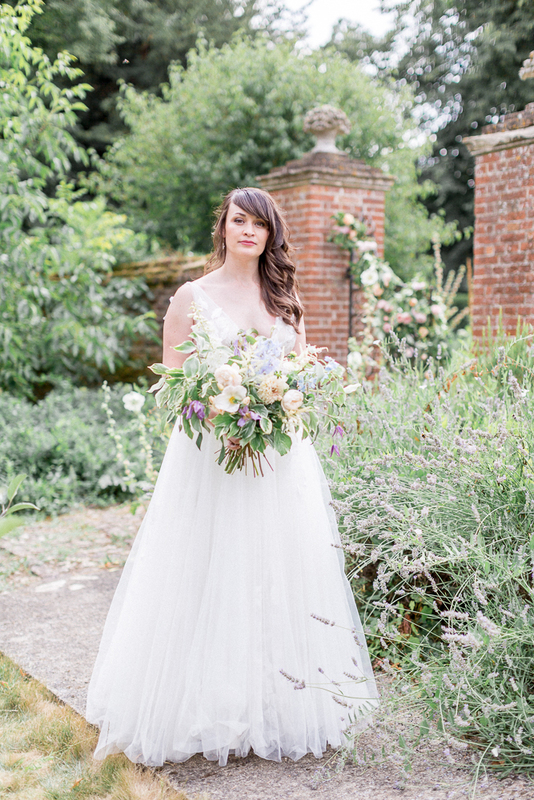 For this shoot, I used a mixture of British scented roses, Cafe au Lait dahlias, delphiniums, astilbe, clematis and cosmos that reflected the colours of the shoot whilst creating a lush English garden feel. 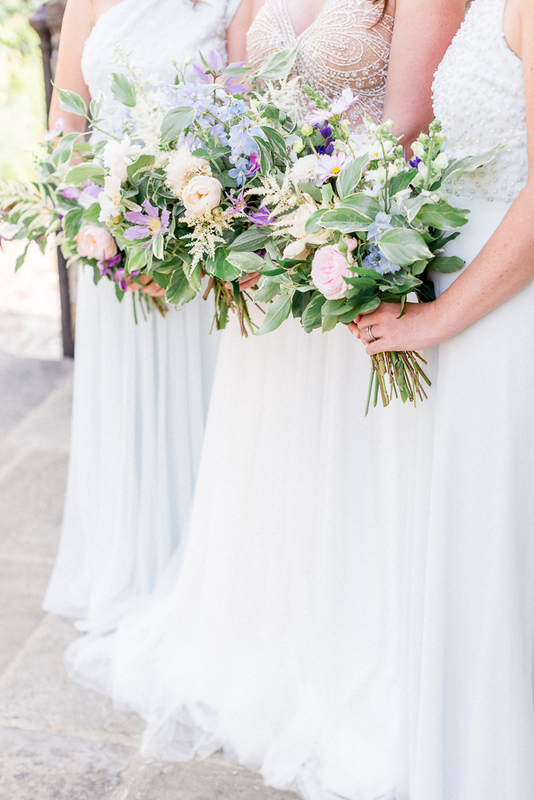 Each of the three bridal bouquets were unique in their mix of flowers showing off their individual styles. 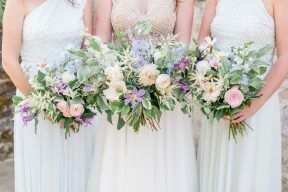 The bridal bouquet was oversized and featured a single British-grown Cafe au Lait dahlia that set it apart from the others. 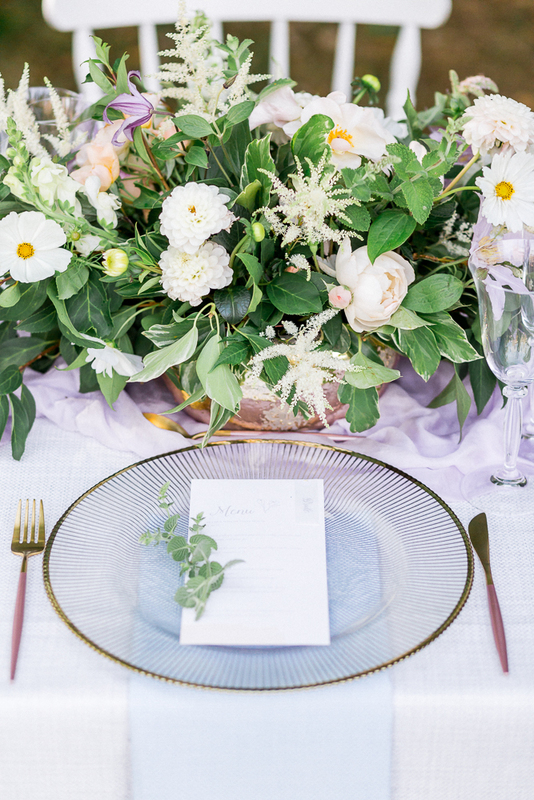 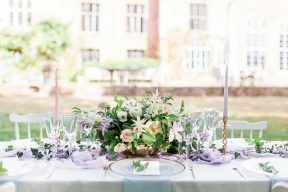 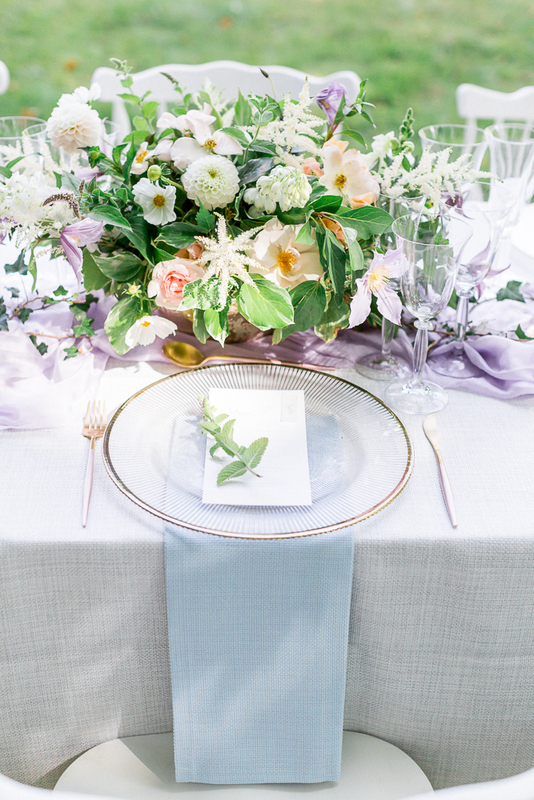 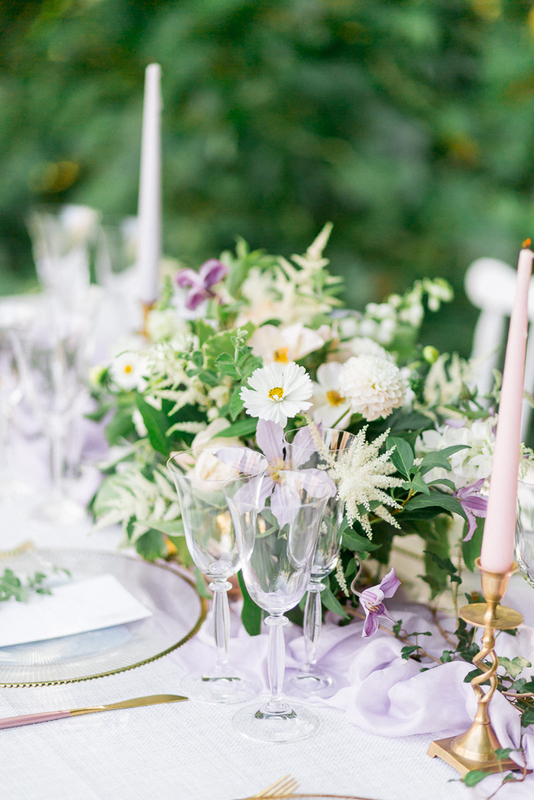 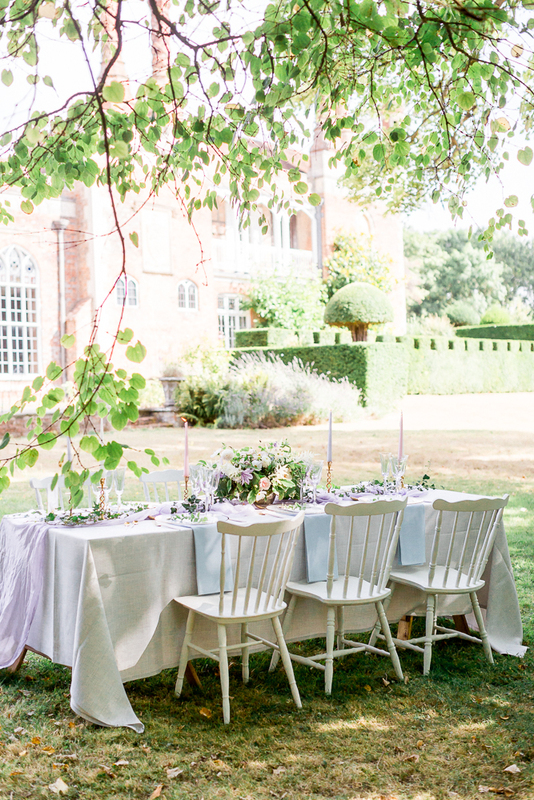 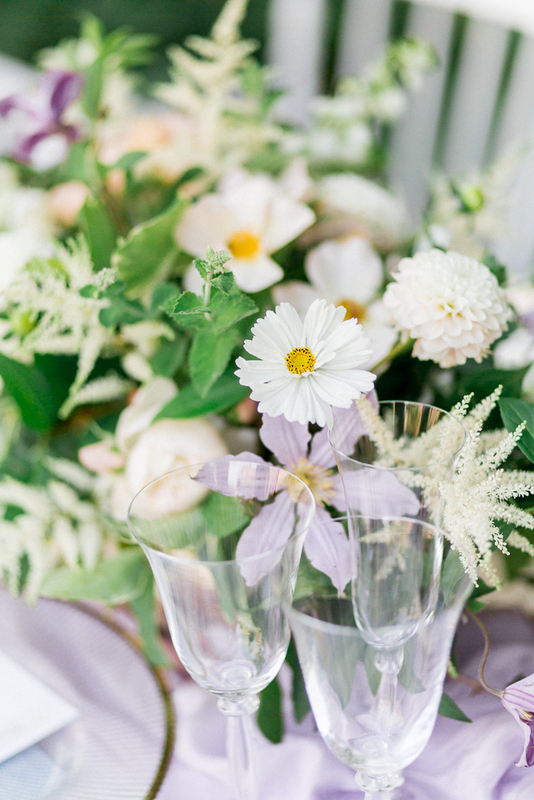 The centrepiece of the table was composed from a mixture of whites and pale pinks peppered with purple clematis all held in a mottled gold vase that sat among green ivy that stretched the length of the table. 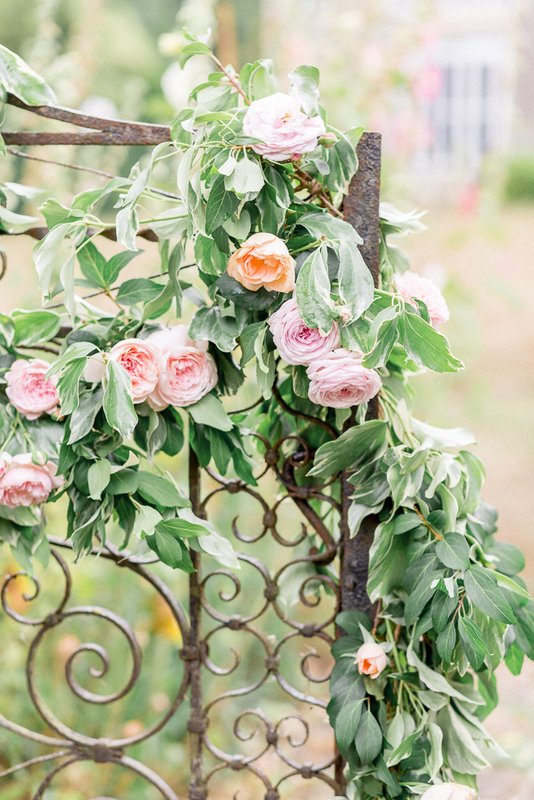 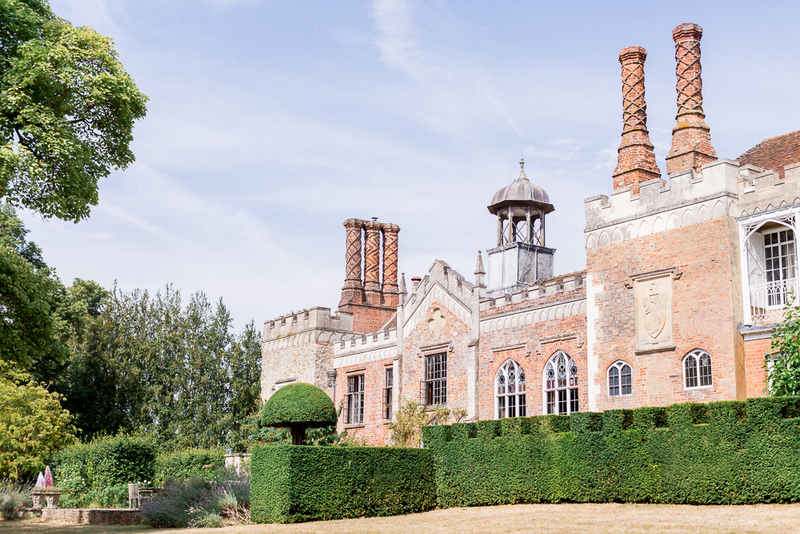 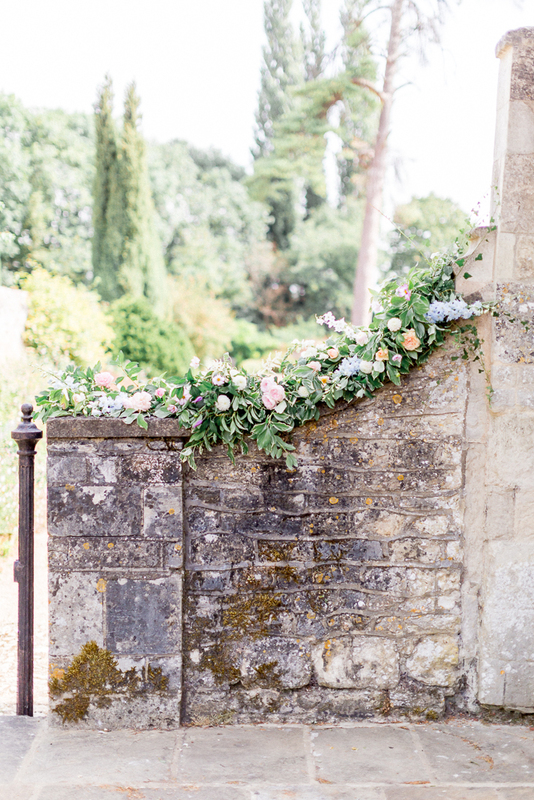 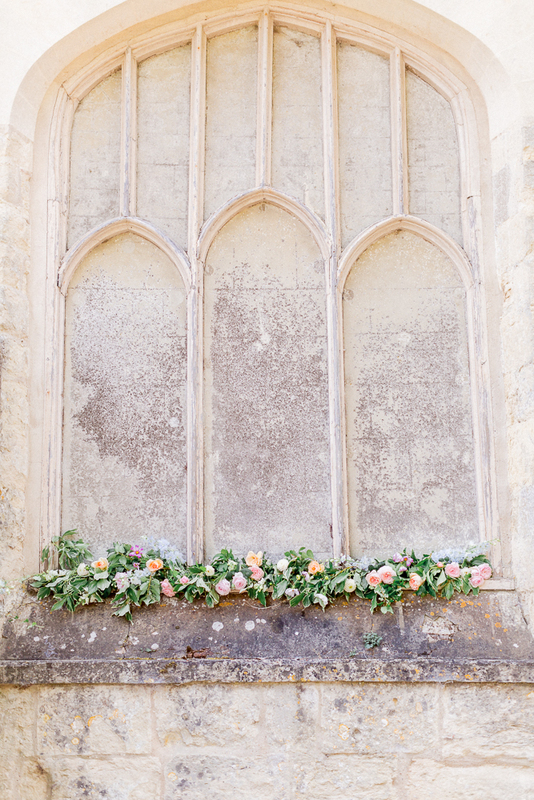 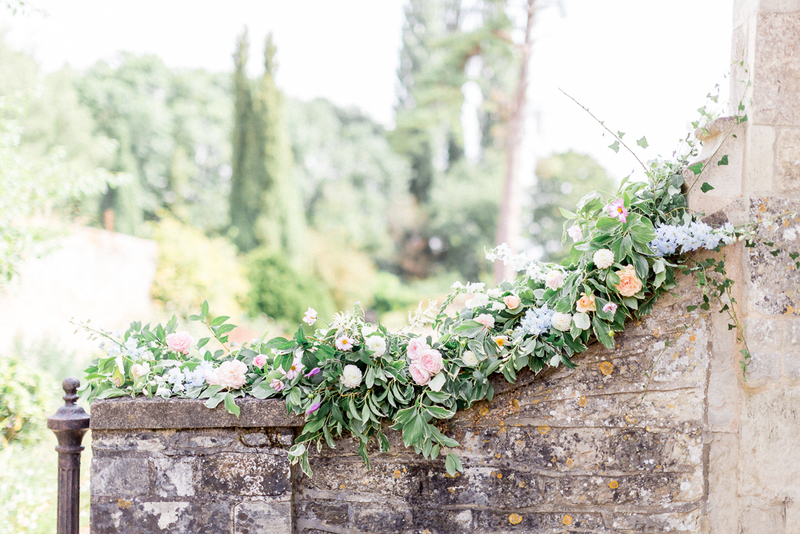 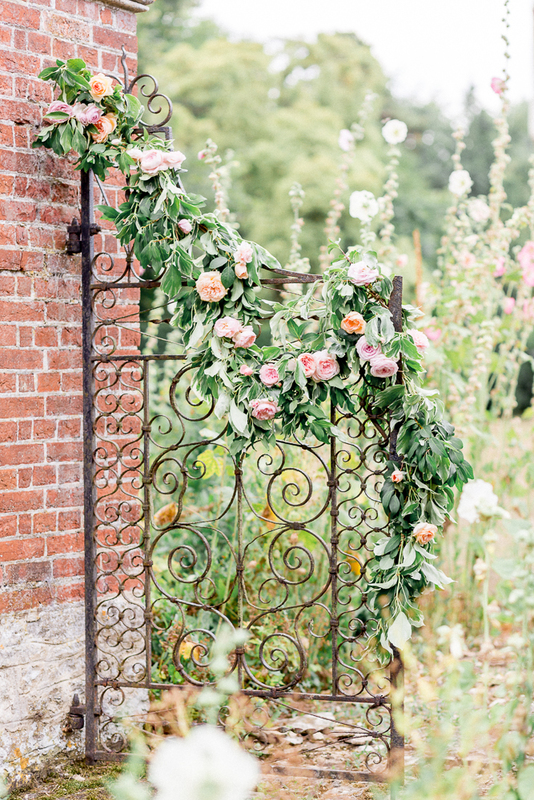 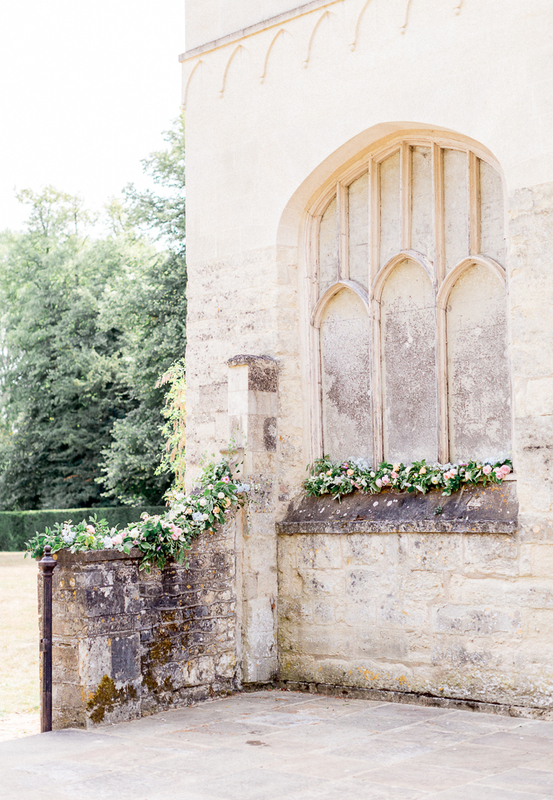 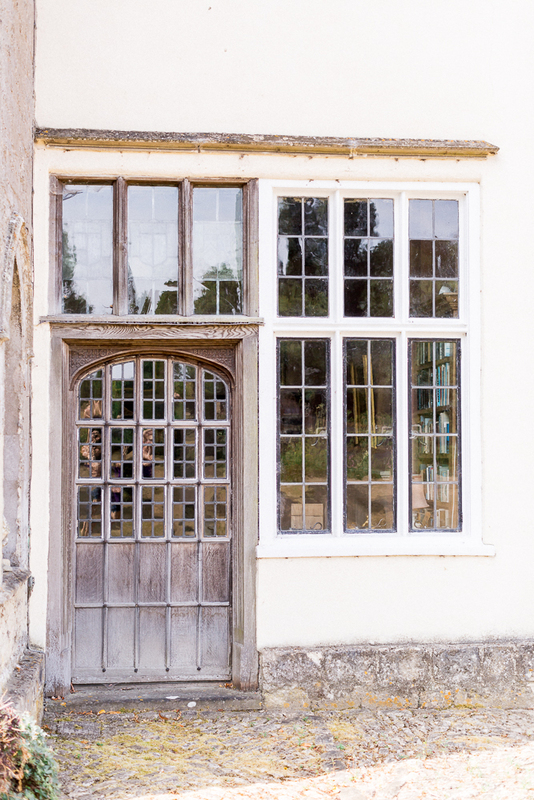 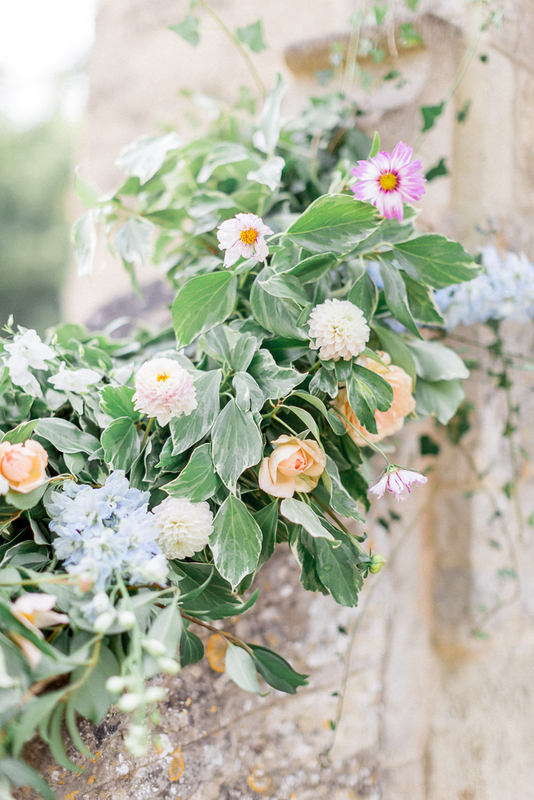 Garlands of foliage woven with English scented roses sat beautifully along the stone work of Nether Winchendon House and gave a romantic and natural feel to venue. 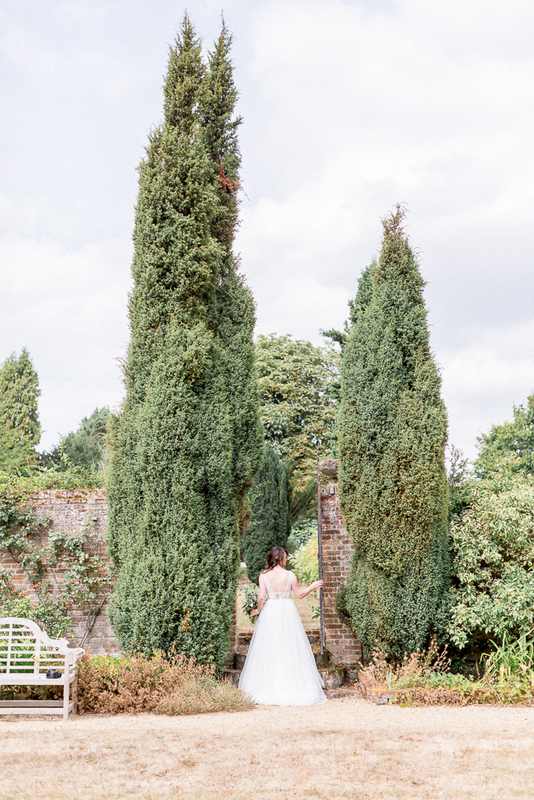 The Bride wears the ‘Scarlett’ tulle skirt by E&W couture styled with Embellished top by Watters Willowby at Halo & Wren. 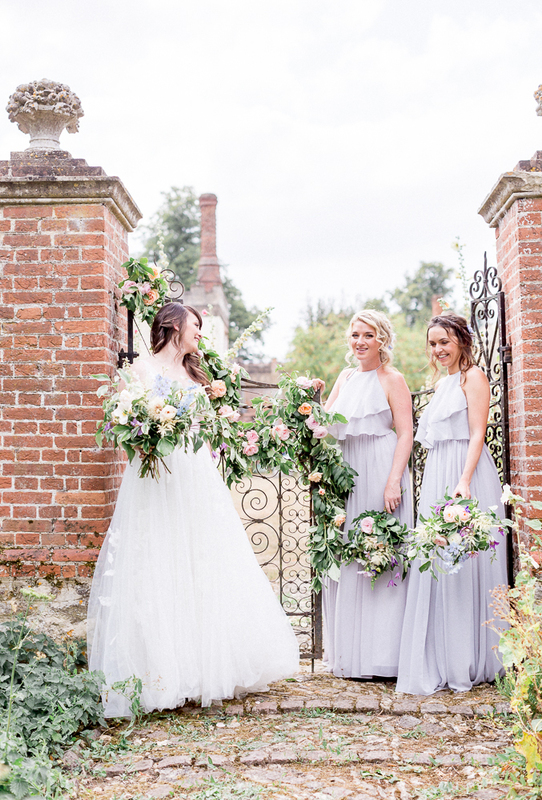 Separates have been a massive bridal trend for this season and it isn’t going away for SS19. 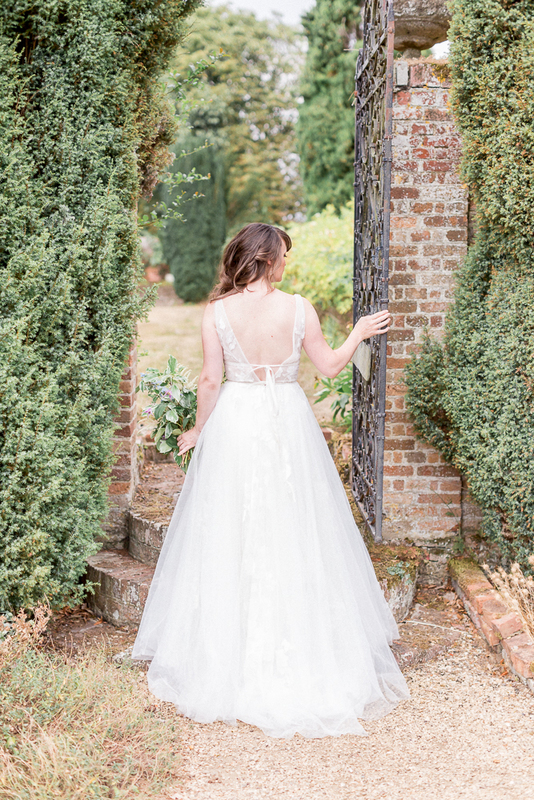 The fully embellished top is eye catching styled with the pretty tulle skirt and both complement each other to create a stunning gown. 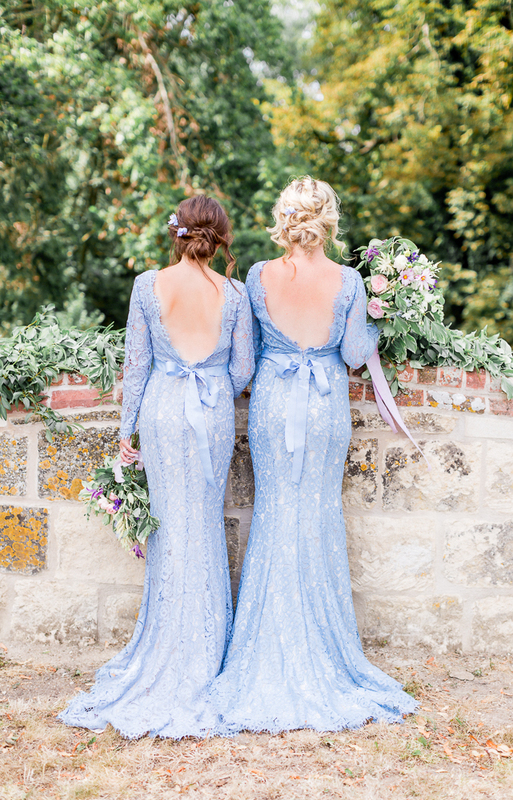 The bridesmaids are wearing Mottee Maids ‘Amelia’ Georgette Polka in Ice Blue and ‘Seraphina’ tulle petal in Ice Blue. 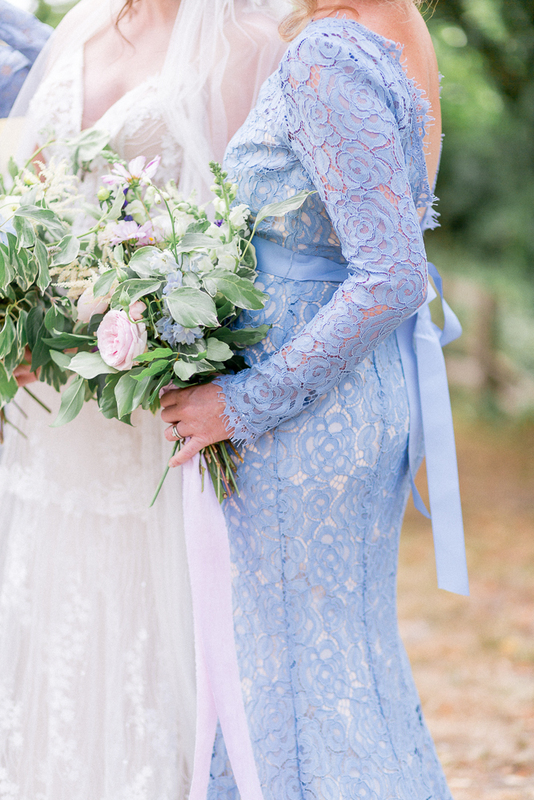 Taking inspiration from SS19’s influential colour, pastel blue. 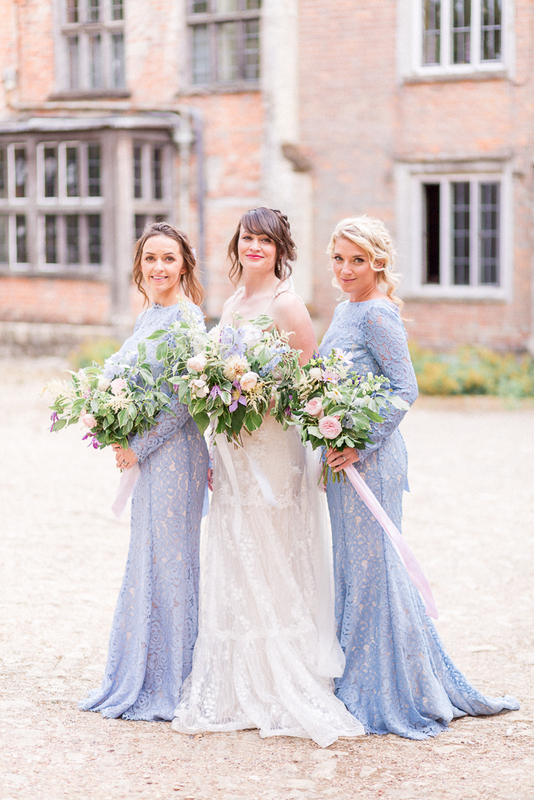 The trend for having bridesmaids in different styles and necklines continues and is pulled together using the subtle embellishment design in this dresses. 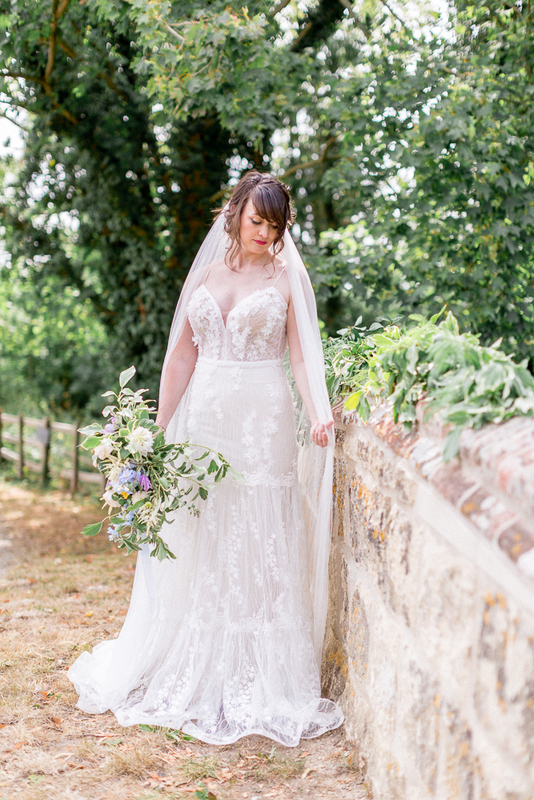 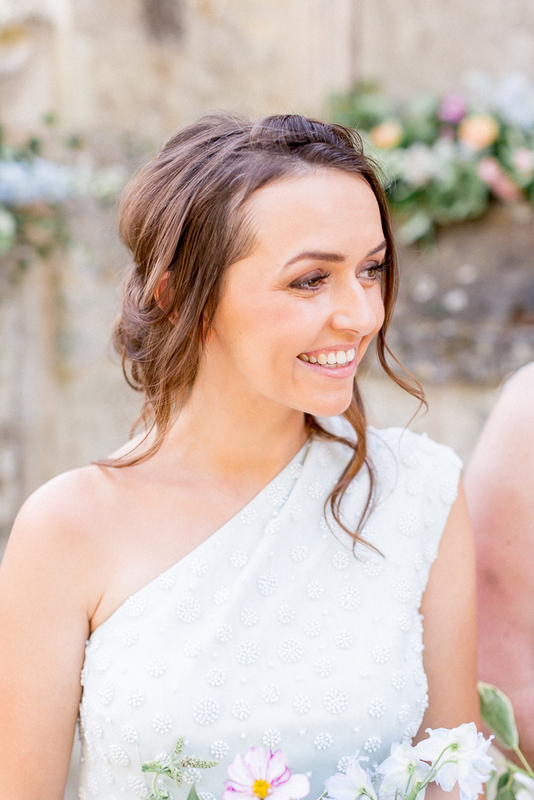 Wearing the ‘Galatea’ wedding dress by Watters Willowby at Halo and Wren. 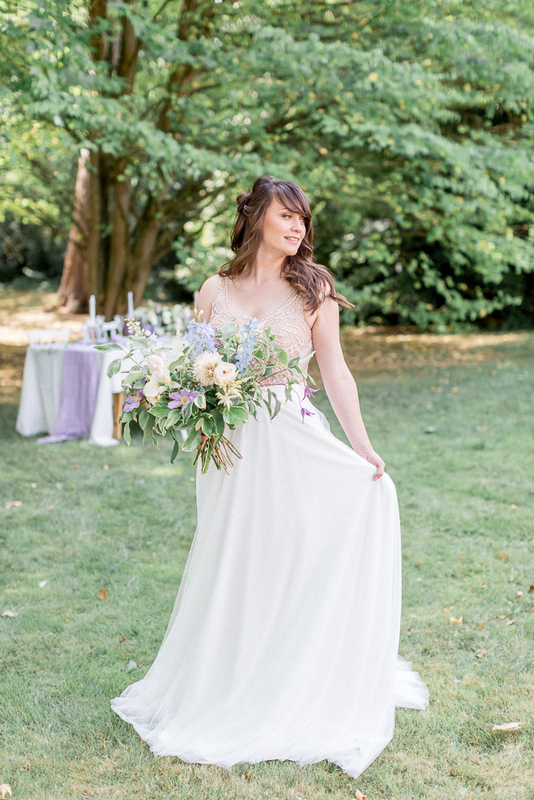 The gown features oversized floral motifs and a beautiful A line silhouette. 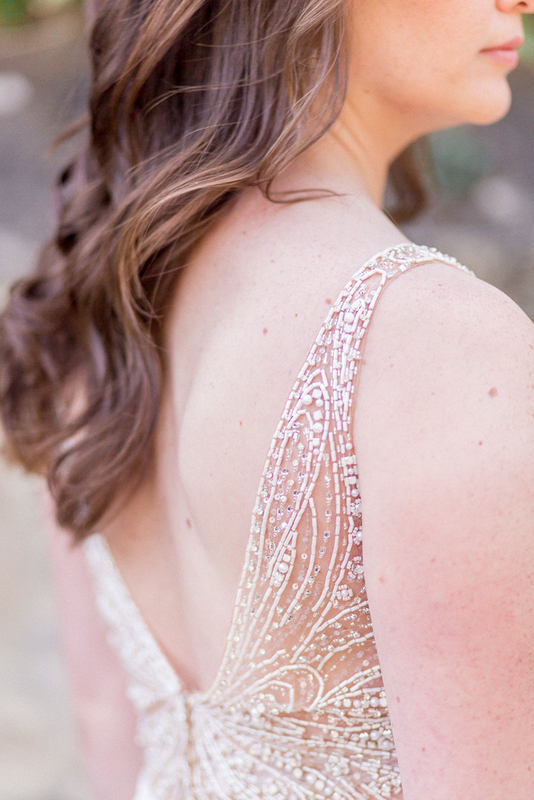 The velvet ribbon wrap bodice adds a delicate added detail. 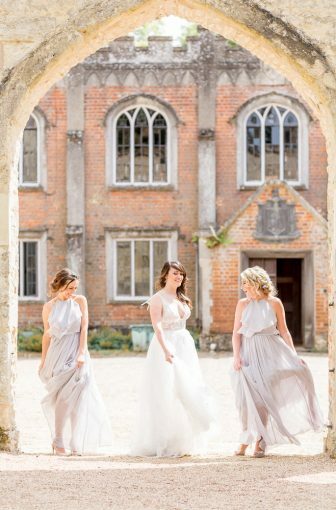 The bridesmaids wear ‘Olympia’ dress in silver mist from TH&TH bridesmaids. 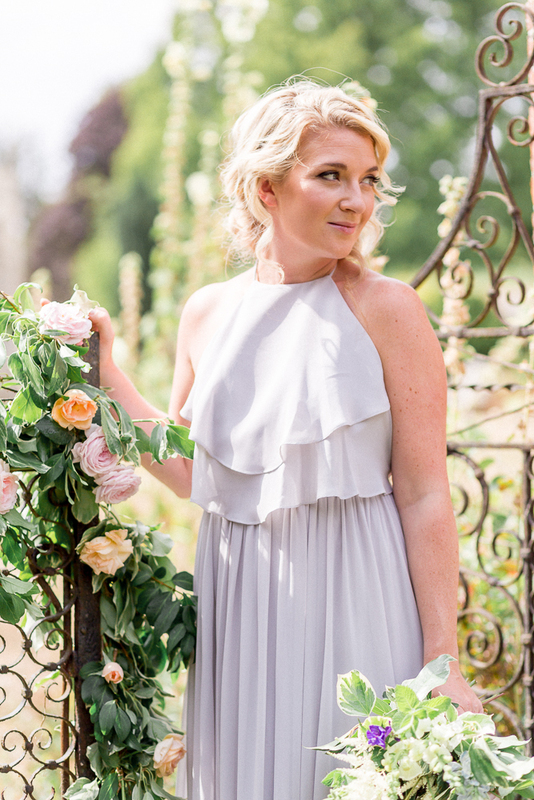 A subtle boho inspired halter dress with ruffle front detail and a feminine deep scooped back. 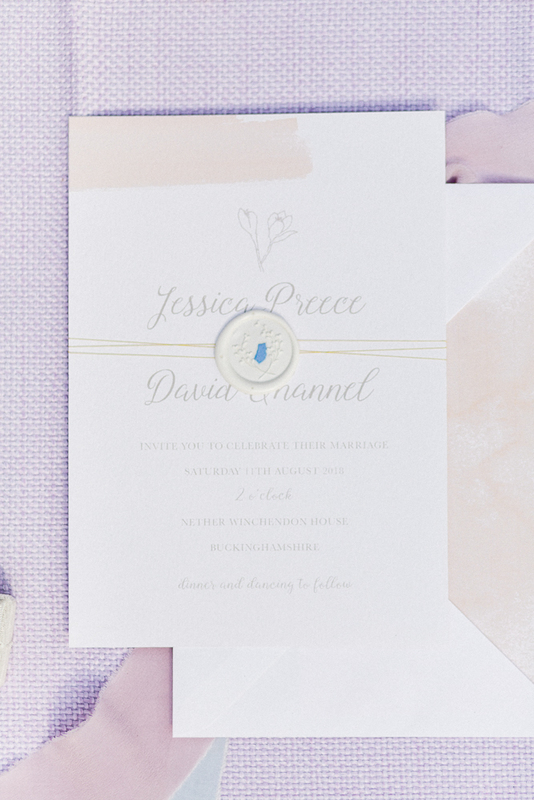 The soft grey/lilac floaty fabric creates an elegant silhouette.